This fine antique Indian silver box has an irregular hexagonal shaped form with one line of symmetry and shaped rounded ends. 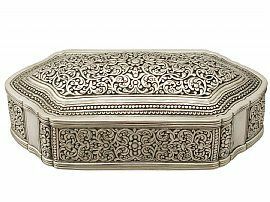 The body of this box is embellished with impressive rope bordered panels of profuse, finely chased Islamic inspired scrolling coriander-leaf designs; a style typically found in Cutch (Kutch) silver work from the second half of the nineteenth century. The profuse decorated panels to the body incorporate two subtly incurved plain panels to either end. The domed hinged shaped cover is ornamented with further fine and impressive scrolling leaf ornamentation featuring a central floral motif and bordered with a variety of rope and geometric shaped borders. The underside of the box reflects a simplified engraved version of the cover's design and incorporates two figures grasping the scrolling stalks. This antique Indian silver box is an exceptional gauge of silver, fine quality and in exceptional presentation condition. The chased decoration is very sharp and the engraved decoration is very crisp. Reflections in photograph may detract from the true representation of this Indian silverware.